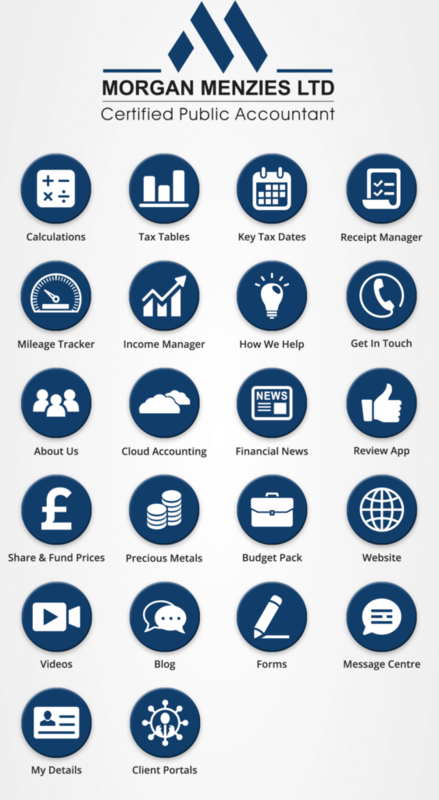 Get the FREE MMAccounts App – it has tons of free finance and tax tools and calculators plus an easy way to keep in touch with Morgan Menzies, send in your receipts and other information and ping us your questions. 18 Calculators – for tax, loans, mortgages, currency and more. Receipt Manager – Never lose a receipt again – simply photograph, add notes and store them in relevant categories. You can simply click to photograph the receipt and then input any relevant data such as receipt name or payment method. This will be a big help, for example, in managing those quarterly VAT returns. Income Tracker – Track daily, weekly and monthly income using the inbuilt Income tool. Log income whether it is personal or business related, take a photo, and save it on the App. GPS Mileage Tracker – Manage mileage on the go, track and log trips all in-App! You can also log a manual journey, and track when you leave the App with our GPS background tracker. You can then export all the data to email. Cloud accounting – You’ll be able to link your Quick Books records directly to us via the MMAccounts App. Currency Converter – Convert currency on-the-go, whether you’re travelling abroad or need to keep up with the economic movements and currency fluctuations. Real time finance news and data – The MMAccounts App will stream the very latest real-time finance news and host the latest market data and share prices, as well as the real-time price of metals. Latest tax and services updates – Latest Morgan Menzies services information, plus notifications about accounting deadlines and any regulations changes that might affect you.